We’ve compiled a PDF document on some of the things to watch out for in the South African Turbo industy. 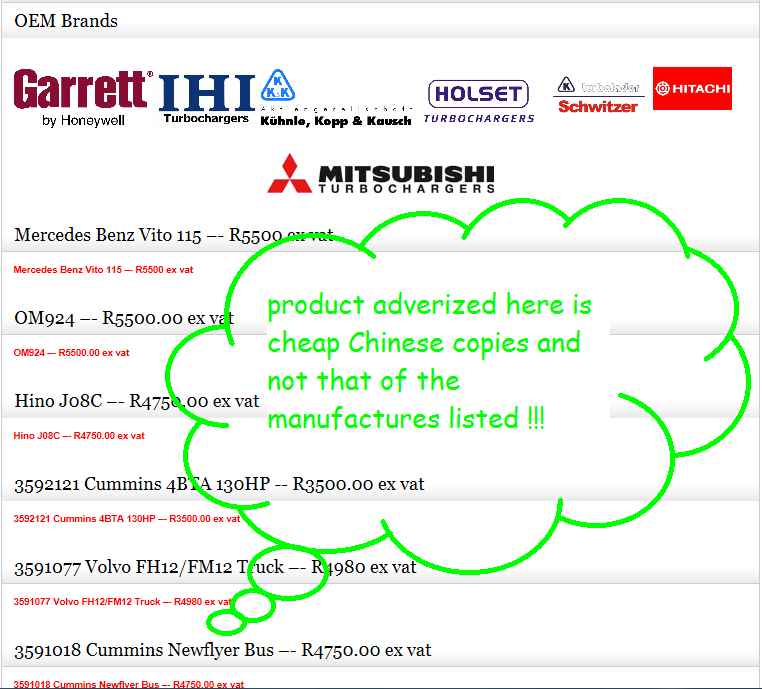 The advert displayed below leads buyers to believe that they are purchasing product of the manufactures displayed. The product advertized here are simply cheap Chinese knock-offs which will cause untold damage to your engine when (not if) they prematurely fail. The company advertising is NOT an Authorized Distributor of BorgWarner /Holset / K turbolader / Hitachi / Schwitzer / IHI or associated brands. If in doubt as to the authenticity of your supplier, contact us and we will gladly give you peace of mind that the prodcut you are purchasing is genuine. The Importance of Asking Why?